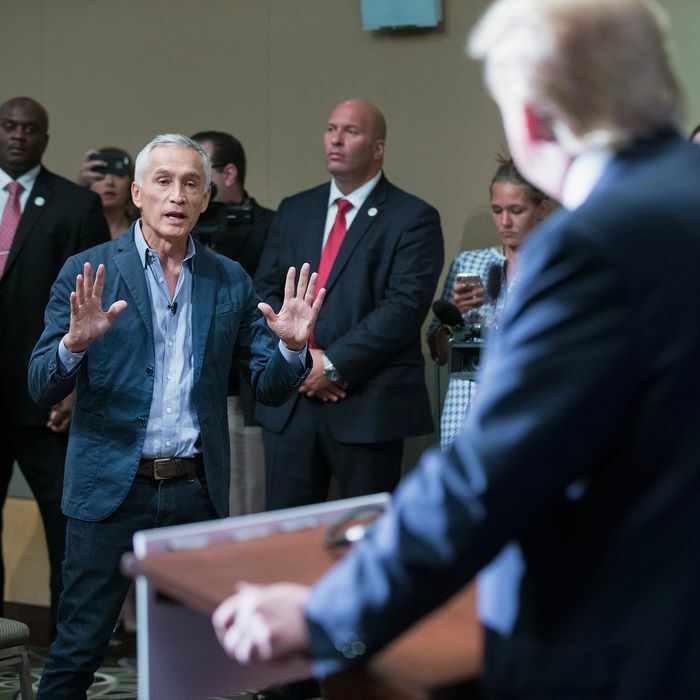 Donald Trump fields a question from Jorge Ramos during a press conference on August 25, 2015 in Dubuque, Iowa. As Ramos continued speaking, Trump looked over at a security officer, who then moved across the room. “I am a reporter. Don’t touch me. I have a right to ask the question,” Ramos protested, but the officer escorted him out. Ramos, who also has a show on Fusion, has been pursuing an interview with Trump for months. When he sent Trump a handwritten request in June, Trump posted the letter on Instagram, exposing Ramos’s cell-phone number (he later deleted the post). CNN Money reports that Ramos decided to travel to Iowa and try to ask Trump a question, though colleagues weren’t sure if he’d be allowed in. Afterward, Ramos said he was “authorized” to be at the press conference, and thought it was his turn to ask a question. “It’s the first time in my life, anywhere in the world, in which I’ve been escorted out of a press conference,” he said. Fusion CEO and president of news for Univision Isaac Lee has invited Trump to continue the conversation. “We’d love for Mr. Trump to sit down for an in-depth interview with Jorge to talk about the specifics of his proposals,” he said in a statement. Trump did end his exchange with Ramos by saying, “You and I, we’ll talk,” so maybe that’s a yes.